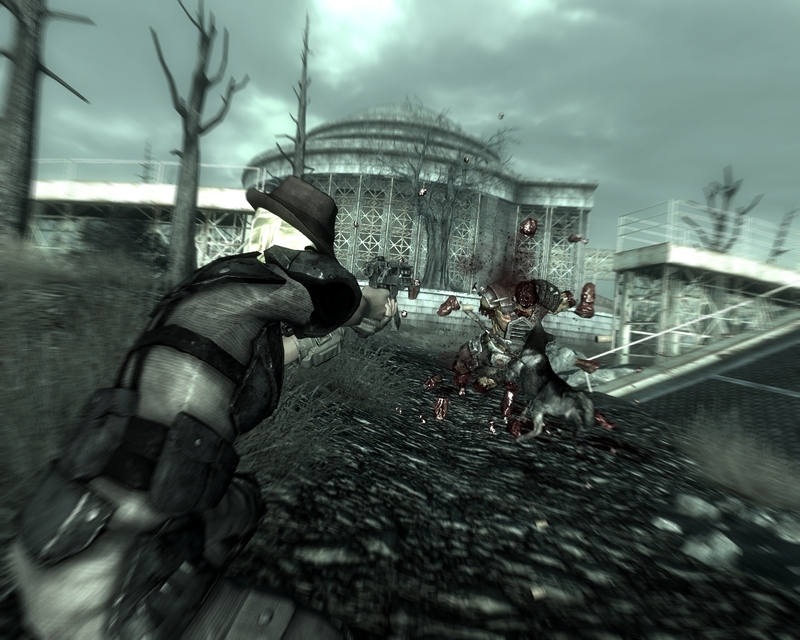 Welcome to another installment in the onging post-apocalyptic adventures of April Shitface. 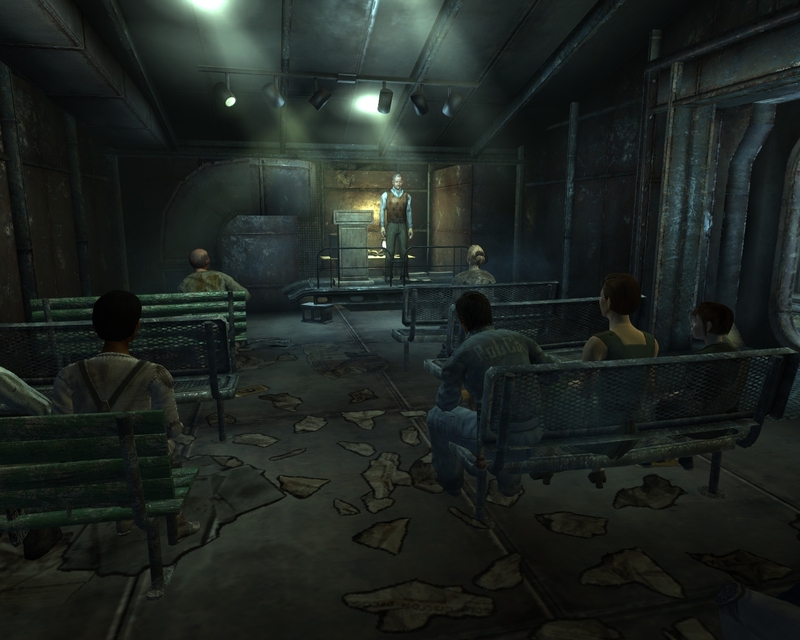 In this episode, she arrives at Rivet City, the post-apocalyptic city of post-apocalyptic dreams, where she makes some new friends. Seeing as how this man seems so casual, with his hands folded over his chest, we can deduce with some certainty that “Agggggghh!! !” must be the way people greet one another here, rather than being an exclamation of pain or despair. And Agggggghh to you too, sir! 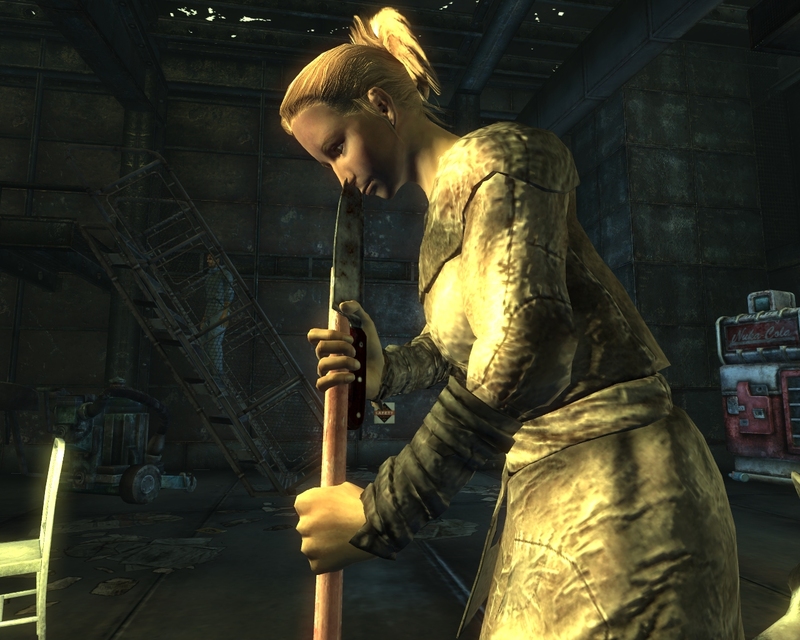 … and sure enough, she soon enough had a horrendous accident when she used both of her hands on the broomstick to sweep the floor, but forgetting she already had a knife in her hand. 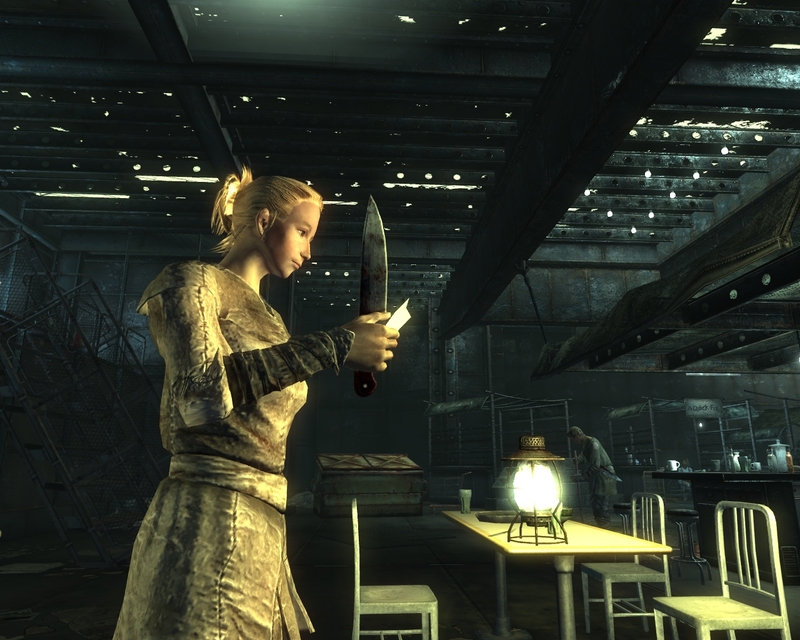 So she ended up repeatedly stabbing herself in the eye and nose area of her face. Ouch. 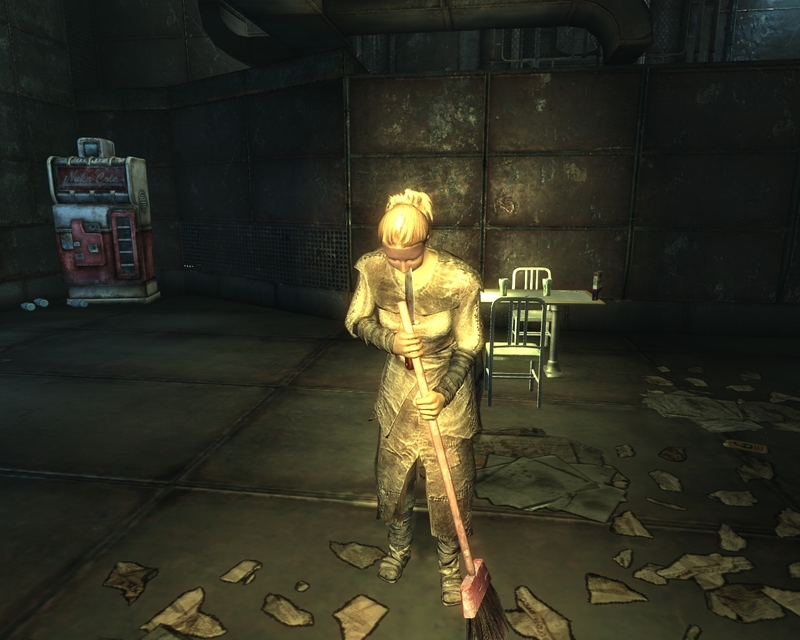 Just like other wastelanders, she doesn’t seem to mind, and just keeps on sweeping, digging the knife around in her face. So has the radiation she’s been exposed to made her incapable of feeling pain? Or maybe she’s too embarrassed by her faux pas to admit it and just keeps on diligently doing her duty; I’m pretty sure Emily Post has written something about how sweeping while carrying sharp instruments is not lady like. 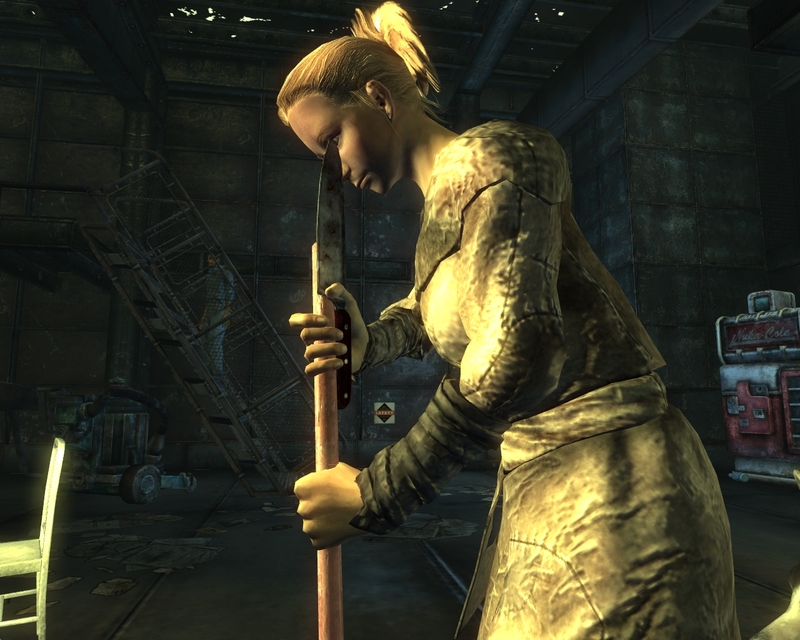 Or maybe the “sweep floor” code somehow got tangled up with the “facestab” code in the game’s databases, and this girl is just a helpless victim, forced to sweep and facestab herself. 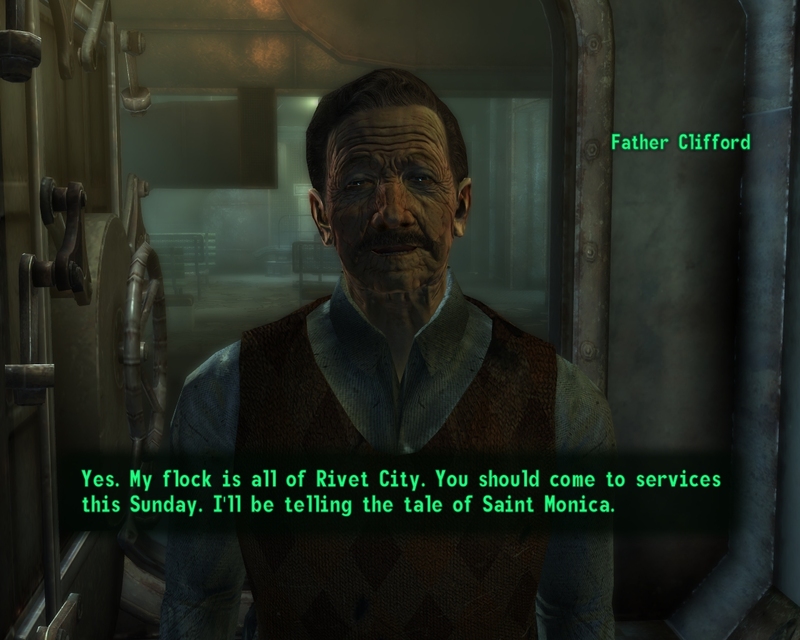 Rivet City’s Father Clifford invited me to attend his Sunday service. So I fast-forwarded the time to Sunday to check it out. The problem was, I never seemed to be able to catch the start of the service – it was always in progress by the time I arrived through the time rift – and those attending seemed to carry on conversations among themselves normally during the service, making it hard to really pay attention to what the good Father was saying. So in frustration, I threw a hand grenade at him, which first cut off his legs, then flung him forwards towards the audience. 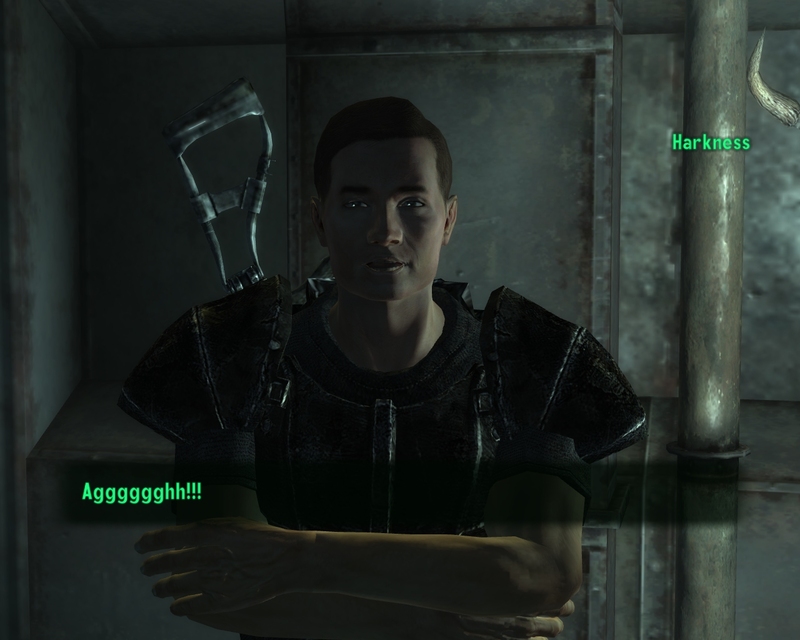 That’s what you get for being noisy during Sunday services: I blow up your preacher, so now no one can have him. You may also notice the strange number at the bottom left of the screen. These, annoyingly, are in a few of the screenshots from here on out. I’m not quite sure why they would appear. For the most part they were blank, reading “0.00”, but sometimes a name of a character or an object would appear – like “Mark” or “sofa”. 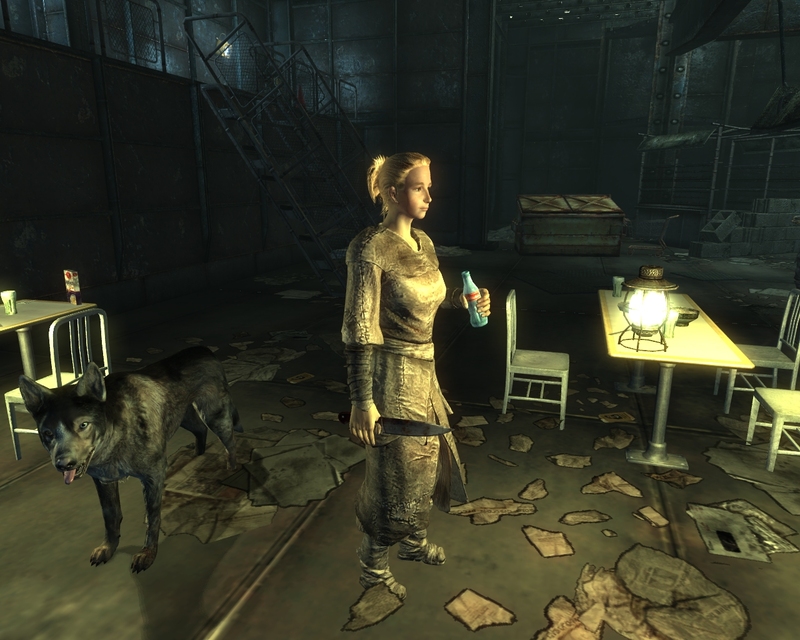 Apil hunting orcs/mutants together with her dog Dogmeat, not far from Rivet City. 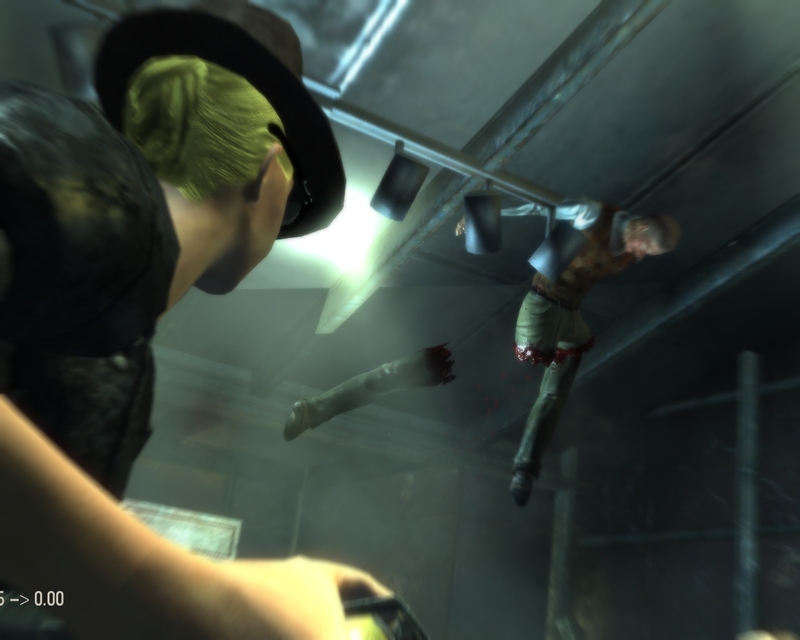 I’m pretty sure limbs aren’t supposed to explode when you shoot someone with a normal handgun. Guess we can thank the Bloody Mess perk for that.